Designed by education experts, loved by kids, Music Learning Lab is a groundbreaking approach to early music education. • For user reviews, see Music Learning Lab under Related. A New & Noteworthy app, featured by Apple in the Education and Music categories! NOTE: If you’ve already purchased the Full Version from within Music Learning Lab, please don’t purchase this app. Learn fundamental principles of music through lessons, games, and a creative composer environment where learners can create songs all on their own - and see them performed by their Music Learning Lab friends! Fun for kids and adults. We’ve applied state-of-the-art learning science research in designing Music Learning Lab. We identified key skills that serve as a foundation for music learning, and designed the lessons in Music Learning Lab using methods that combine our love and knowledge of music with principles derived from basic learning sciences research. The result is that learners acquire an important set of music skills, and have a tremendous amount of fun doing it. Every learner will be ready for music lessons, using music software such as GarageBand®, and further music instruction privately or in school. See trophies that represent everything a learner has achieved, and watch fun animations that demonstrate their accomplishments. • three mini-games in the Play area to practice and extend skills learned in the lessons. 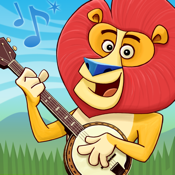 Explore Music Learning Lab to earn all 15 instruments, nine backing bands, and 32 trophies! "The instruction is very well designed, and the animations will delight your children. If your children are used to playing games on an iPad, they'll really enjoy this app, and be all set for their future in music. You'll probably enjoy it yourself, too."